Gold foil is a traditional handicraft in China, which has about 3000 years history. We also call it gold leaf since the less than 0.1 micro thickness. The ancient Chinese people use gold leaf for royal and religionary decoration to get a gorgeous effect. But now Art Gold Foil brings you various souvenirs and collections made of gold leaf for your gorgeous life. 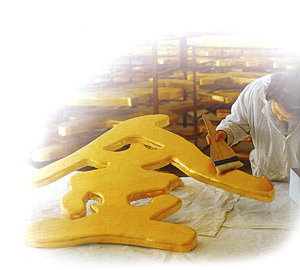 You may choose a gold leaf painting as the best gift whether in famous Chinese style or in western style. A gold leaf Buddha or knickknack will bring you the best wishes. Gold VIP card or gold leaf calling card will show your exalted position in your business. © Copyright 2002 Nanjing Art Gold Foil Factory. All rights reserved.